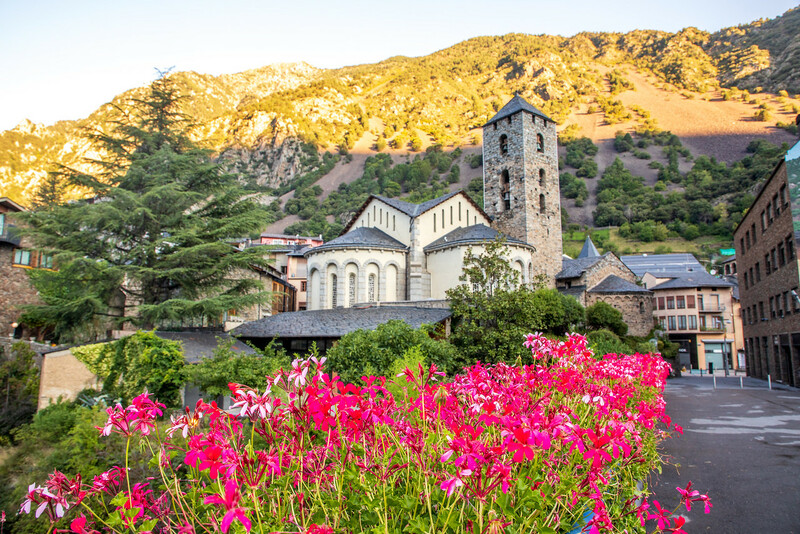 On our way to our barge trip on the Canal du Midi in the south of France, we decided to go via Andorra and spend a night there. Why Andorra? Well, we have never been there, and it was sort of in the right direction to meet our friends in Béziers, France. Now, the tiny country of Andorra is probably best known for its ski resorts, but we weren’t going to be seeing snow in the middle of August. Well, in these crazy times with climate change, maybe we would! Here are some interesting facts about Andorra that we learned during our short stay. It’s the 6th smallest nation in Europe. It’s the 16th smallest country in the world by land. Andorra’s capital city, Andorra la Vella, high in the Pryenees Mountains, at 3,356 feet above sea level, is the highest capital city in Europe. The official language is Catalan but French, Spanish and English are widely spoken. Euro is its official currency of Andorra. It’s not part of the EU, but we didn’t need to show our passports when we entered and left the country. The drive up from Spain to Andorra was beautiful. The scenery was stunning. In fact, we pulled over several times just to admire the view, take photos and fly the drone. We were getting quite excited by now about exploring Andorra. Passing through border control into Andorra was easy, as we just drove through, nobody wanted to look at our passports. But although we were surrounded on either side by majestic mountains, now we were faced with billboards advertising duty-free shops, and petrol stations, lots of petrol stations. Now admittedly, petrol was a whole lot less here than in Spain and France but really do they need that many? Are crowds of French and Spanish driving up winding mountain roads to save 20 cents a litre? As we drove around Andorra la Vella a few times trying to find our hotel and where to park, it was like driving along a High Street or strip mall hemmed in by mountains either side, with 1000’s of shops selling duty-free cigarettes, alcohol and perfume. In fact, the city centre smells of strong perfume and cigarettes. This wasn’t quite what we were expecting although we did purchase a bottle of gin and a very nice bottle of aged rum! Well, it’s duty-free! There was a historic part of Andorra la Vella, the Barri Antic, and this was lovely and worth exploring. Filled with charming old buildings, churches and local restaurants but it was very small. You only need about 20 minutes to explore the old part, and I’m being generous and yep, you have seen the old town. One of the oldest buildings in the Barri Antic is the Casa de la Vall. 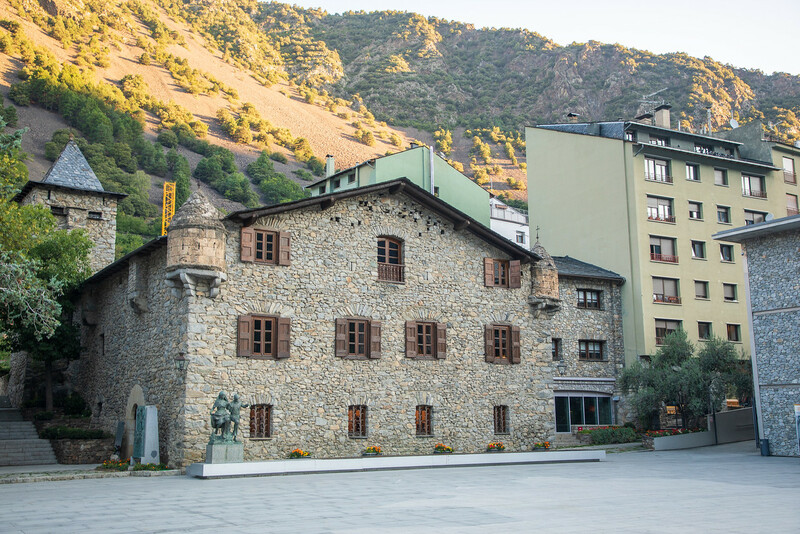 It was built in the late 16th century and was the head office of the Andorran Parliament until 2011. It’s possible to go inside and have a look around but not on Sunday afternoons. There’s also the old church of Sant Esteve, a charming pre-Romanesque style church and many other old buildings, many of which are now restaurants. We were hoping to try some local Andorran food. 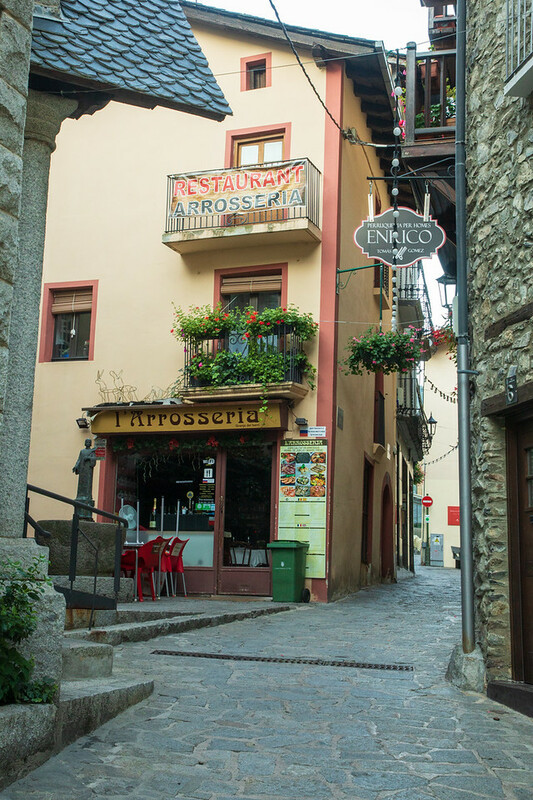 In the historic part of Andorra la Vella, there are many quaint looking restaurants specialising in local dishes, but unfortunately, most are closed on Sunday evenings. So we settled for Mexican food instead. It was ok for Mexican food served high up in the Pyrenees but not as spicy as we would have liked. We booked with Booking.com and stayed at the three-star Hotel de L’Isard for €50 a night. The hotel was centrally located but to be honest, everything is centrally located in Andorra la Vella, but it had car parking which is important in this city. Parking can be a bit tricky. The drive from Andorra into France was possibly more stunning than the drive up from Spain. The small towns we passed through on the way out of Andorra looked a little bit more charming than Andorra la Vella but probably still not enough to keep us amused for 24 hours. Would we go again? Well, no need to return to the capital, maybe we would return to Andorra in the summer for hiking or cycling, or in the winter to visit the ski areas, I don’t know. It’s certainly not on our ‘Oh, we could live here list,’ like many other places. But for now, we were eager to meet our friends and explore the Canal du Midi in France. hola! so, if Andorra is not part of EU, can you go there after spending 3 months in another European countries? I know is a law (or something like that) that don’t allow you to stay more than 3 months living in EU if you are not european resident or citizen.. I guess, in theory as Andorra is not part of Schengen but if they don’t check your passport, you will have to prove that you weren’t in the EU. Best thing is to check with the Andorran embassy about visas. Never been to Andorra. It’s on my list though. Thanks for the tips, they’ll come in handy when I decide to go! I am fascinated by small countries so I hope to make it to Andorra some time. It seems a bit far to go to get Mexican food! 😉 we’ve been frustrated with non-touristy times too. But the views sound amazing and at least a drive through. I passed through Andorra many years ago but would like to revisit for at least an overnight, the old town looks really pretty and lovely to explore on foot. Wow, I never knew Andorra has the highest life expectancy, I thought it was Okinawa! I love the look of Andorra, and with it being landlocked between France and Spain. I’ll also remember to turn off my roaming; I had no idea it wasn’t in the EU. I have been all around but never reached Andorra. You article shows that it is worth to go there, not only during the winter. LOve the architecture. I never heard about Andorra, Thanks a lot for sharing about this beautiful place. Am actually saving this post for my future travels. I’m not going to lie, I knew almost nothing about Andorra before reading your post. For such a small country, it’s got quite a few claims to fame, like having the highest capital city! 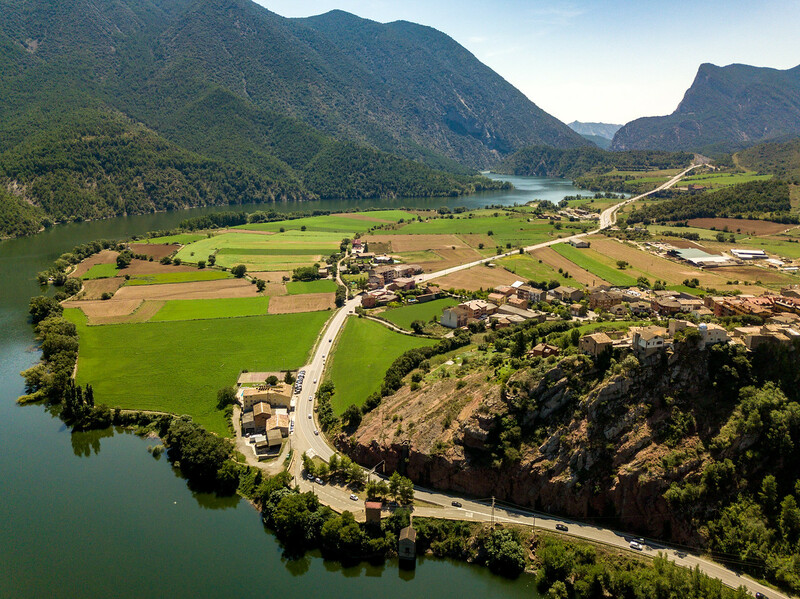 Your story of road tripping there from Spain sounds like the exact kind of trip I’d love to take, so that’s how I would plan on getting to Andorra as well! It looks like a beautiful little country with lots to offer!